Mulder and Scully make a baby. Mulder and Scully get married and leave the Bureau. Scully needs to do something about Mulder's attitude, especially once she realizes it's personal. Just a short story about how I would feel if my partner did the boneheaded kind of things Mulder manages to pull off. Skinner doesn't understand how Scully can be so calm. Post Monday, Scully confronts another lifetime and Mulder is on the receiving end. Mulder and Scully go after some pirates of the Caribbean. Hey, it's the Bermuda Triangle. Scully deals with the aftermath of Mulder's case. Post ep for "I Want To Believe." Mulder determines how to cure Scully's cancer in a way that brings them both some new realizations. Sometimes it gets pretty boring on the road. A little harmless entertainment can help pass the long nights. Finally, a little MT from the episode "Rain King." 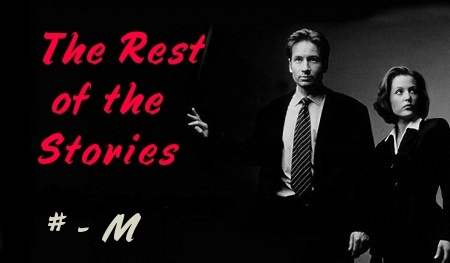 Fill in the blanks for Brand X, in Mulder's own words. post IWTB, our two favorite agents are entering a brave new world. Will they be able to meet it? Scully confronts Mulder and fixes his broken finger. Two agents, one pizza delivery vampire and a wooden chair leg. Mulder and Scully are on the outs, but still together on the things that truly matter. Mulder is getting the burns on his arms cared for, but is the case really over? JoBeth Carson crosses paths with the FBI once again. I always wondered how Scully came to her Epiphany the next day. What happens about three months after the exorcism in "The Calusari." Post-ep for "Triangle" but not quite what you might expect. Mulder drags Scully to her class reunion. Dana Scully, newly assigned agent to the X Files Division, deals with the dilemma of having two men in her life. Mulder's thoughts when he's been shot. Post ep for "Vienen" and pre ep for "Alone." Mulder reaches a conclusion. In business and in government, when a man and a woman are caught in a compromising position, it's always worse for the woman. Continuing the scene after the door closed at the end of DeadAlive. Mulder is depressed, Skinner is suspicious, Scully is worried. Oh, and Linda Bowman is in there, too. Mulder is experiencing a some residual affects after his run in with Eugene. What happened between Mulder collapsing and Scully typing at the end of the episode "Demons." It's Halloween night and Mulder and Scully get caught up in a manhunt. Mulder finds Scully at Mass after a hard case. They both get something out of it. Mulder and Scully, still on the lam with William in tow, stumble onto an ancient Native American legend in the badlands of South Dakota. The quarantine that was imposed following the outbreak of F. Emasculata and what happened to our favorite FBI agents. No, it can't be happening! Not the Rift again! I thought we resolved that damn plot line! Well, looks like I'm just gonna have to resolve it *again*. Many changes are coming for Mulder and Scully and Mulder is afraid of what it will mean for them as partners. Follow up to the ending of "Grotesque." Fill in the blank for "I Want To Believe" -- Skinner hug to last scene. His head hurt. Mulder's eyes were still tightly clamped shut, but he knew without even looking that whatever light there was would surely burn a hole right through his brain. He was not going to open his eyes for love nor money. After Scully walked away from Mulder standing in his doorway, what was she thinking? Between 'you . . . help . . . me' and Scully coming to Mulder's door in "Amor Fati" a whole lot happened. Mulder finds a connection to the case that he never could have expected. Post "Three Words," Mulder and Scully finally have it out. Fill in the blanks of "Folie a Deux." What happened between May 2002 and January 2008. Another Christmas is fast approaching and Scully gets an unexpected present from her big brother Bill. Unexpected and unwanted. Mulder stands at a grave side and remembers. The recent furlough of the Federal Government was just too good to pass up. How Mr. and Mrs. Mulder made the choice between the two children. How did Scully and Mulder get alllllllll those pencils down from the ceiling? Mulder just can't seem to catch a break. Things go from bad to much, much worse. Mulder's back, the baby's born, and now it's time to come home. Scully examines her heart after things have calmed down. Scully, the Gunmen, a bottle of tequila and only one lime. The truth is out there or rather, in here. An alternate ending to the episode "Herrenvolk." The smile on her face was worth a hundred dollar bottle of wine. What exactly is the effect of exposure to LSDM? While still working on Domestic Terrorism, Scully takes a vacation and Mulder finds himself doing a profile. Maggie gets a late night call. Bits and Pieces connecting the dots from the beginning to the end of "Vienen" through Mulder's point of view. A "fill in the blank" companion piece to Susan Proto's "Under the Weather". Just a typical day in the life of a minor character. Can you guess who it is? The last possible fill-in-the-blank for FTF. Mulder and Scully bond as they compare near death experiences. What happened from the time of Scully's phone call on Friday to the time Mulder wakes up on Sunday and beyond. Demons aftermath as told by Scully. I have rewritten the season finale (or should I say 'prewritten' since I haven't seen it yet), tying up as many loose ends and staying as consistent as I could to what has come up during the sixth season. Scully realizes how important her religion is to her. Part of Susan Proto's Life Cycles series. Flick spoiler fic -- with a slight twist. How did Mulder and Scully spend Christmas Eve, 1999? There is shipper, and then there is this. Some call it sap, some call it mush, some call it mind candy, but I call it an argument in defense of an action. They didn't show all the people affected by the day. One mother's view. A fill in the blank from "The Erlenmeyer Flask." What happened after the exchange on the bridge. Maggie gets another late night phone call that changes her world. Fill in the blank, like the quantum leap from the DOD to Mulder's apartment. Mulder sets the record straight.